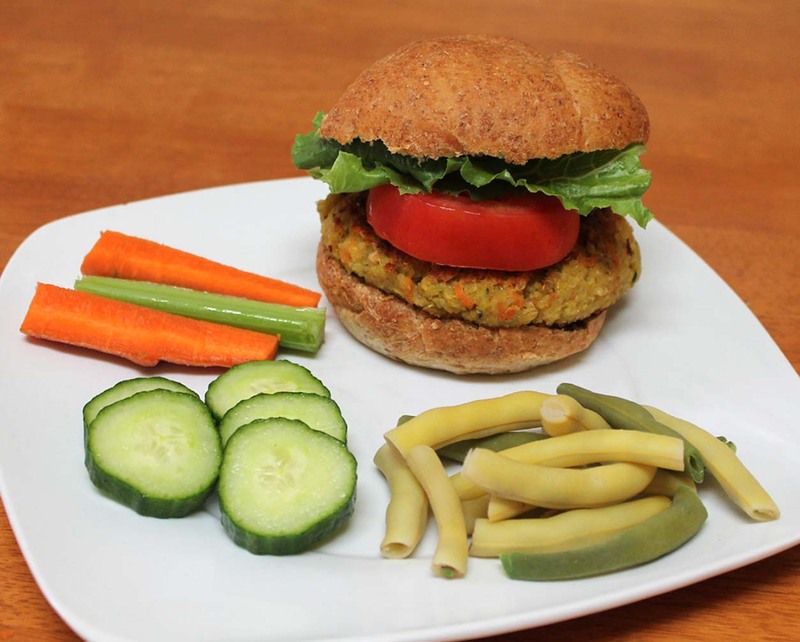 Quinoa and Red Lentil Veggie Burgers | Live. Learn. Love. Eat. 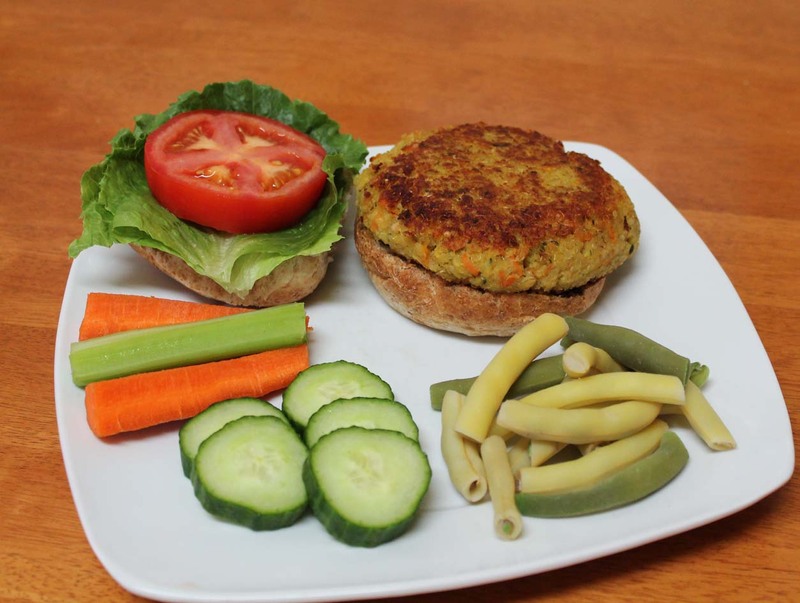 These vegan burgers are wheat-free, soy-free, sugar-free and made with wholesome, healthy ingredients, including red lentils, quinoa, oats, carrots and zucchini. They are softer in texture than meat burgers and have a nice subtle flavor from the vegetable broth, onion, garlic and parsley. Serve on a bun with your favorite toppings, or with a side salad or raw vegetables for a lighter meal. Bring the 2 cups of water to boil in a medium saucepan. Add the quinoa, stir, reduce heat to low, cover and cook for 20 minutes. At the same time as you bring the water to a boil, bring the vegetable broth to boil in a small saucepan. Add the red lentils, stir, reduce heat to low, cover and cook for 20 minutes. 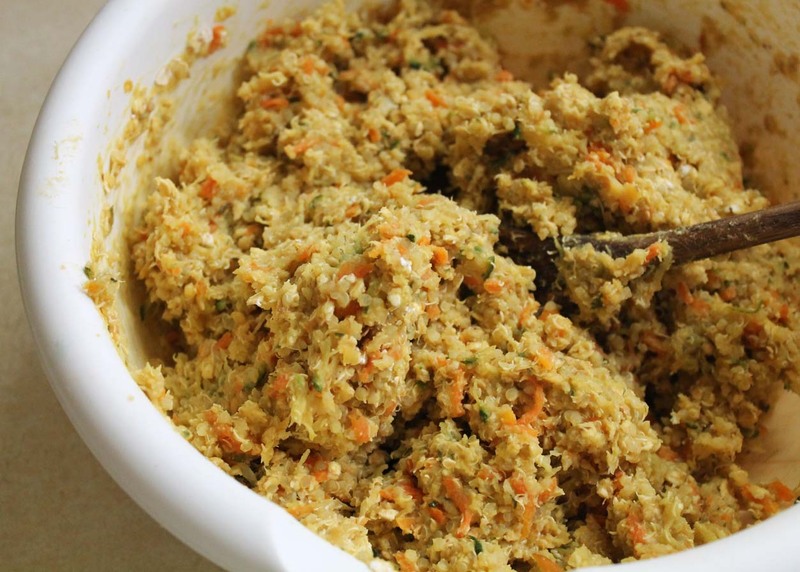 While the quinoa and lentils are cooking, shred the carrots, zucchini, celery and onion in a food processor. Heat a large skillet over medium-high heat. Add the shredded vegetables to the skillet, as well as the pressed garlic and parsley. Cook the vegetables for 20-25 minutes, until very soft. Once the quinoa and lentils have finished cooking, place them into a large mixing bowl. Add the soft, cooked vegetables. Allow the mixture to sit a while and cool, then add the sea salt, nutritional yeast and oats and stir to combine. Again, allow the mixture to cool. You can even place it into the fridge for anywhere from 20-30 minutes, or cover it and store it in the fridge for later use. 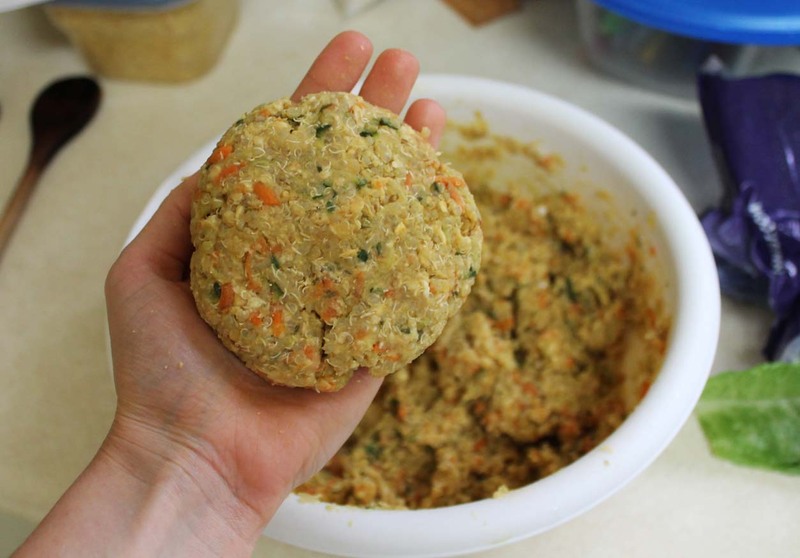 Form the mixture into large 2 1/2 inch balls and then flatten them down slightly to make burger patties. Heat a tiny bit of sunflower oil in a large skillet and fry the burgers for a few minutes on each side until brown and crispy. Serve with lettuce and tomato and your favorite condiments on a bun or just eat the fried burger patties with raw vegetables and hummus or a side salad for something lighter. I think I have everything on hand to make these this weekend. They look terrific. I’ll try to freeze some before cooking. I’m the only plant based eater in the house, and these would be great for a quick dinner after work. Thanks for sharing the recipe! Oh YUM … Quinoa has such a lovely, nutty flavor … bet these burgers are delicious! I’ve bookmarked and will definitely be trying them out! Thanks, Tiffany! Yum! I love new ways to use quinoa! These look great Tiffany , can’t wait to try them out. I made this last night….yummy! Best veggie burger I’ve tasted by far. It could even be used for sloppy vegan joe! Love it. Thanks again. I believe this is my new go to site for recipes. Up next I will make the banana blueberry muffins. LOVE your site. Trying to eat healthy in the new year and looking into vegan dishes. I love quinoa so this is a double yay! Hi Elana! Normal yeast is not the same as nutritional yeast. Nutritional yeast is used to give the burgers more flavor. You could omit it altogether and just add breadcrumbs or extra oats so that it is not too mushy (the nutritional yeast is also used as dry ingredient in the recipe). I hope you like them! I made these yesterday and we had them for lunch today too! 🙂 Good luck with your healthy eating resolution. I hope that you find some recipes here that you enjoy! Hi Tiffany! I’m new to this vegan thing…. Was wondering, could I have a substitute for zucchini? We just aren’t fans. Thanks for the recipes! I made this for lunch today, the only changes I made was I added tapioca flour to bind and added some vegan Worcester sauce and some kitchen bouquet for coloring & flavoring. My husband said its the best veggie burger he’s ever eaten and I’ve made many different recipes from cookbooks and the Internet. Your recipe is the one I’ll use from now on. This is the first time I’ve visited your site and I can’t wait to try more of your recipes. Do you any grain free recipes? Thank you so much for your comment Carmen! I am happy to hear that the recipe was a hit! 🙂 I am going to be sharing more new recipes soon, so stay posted! There will be a variety of new things!